If you would like one of our Balljoint Adapter kits, see ordering info here: http://www.v8monza.com/bja-order_info.htm. You'll get a Balljoint Adapter Kit, a basic instruction package, and this web address where you can always come back for more information and e-mail me any questions. These instructions are a compilation of my experience in this modification. Your experience may differ. This kit in itself does not improve or degrade the braking capabilities of the H-Body. However, through effective brake system tuning the braking ability of the H-Body can be increased dramatically. If you find errors, have any suggestions, personal experiences, or information you think would be useful here please e-mail me. I won't be liable for any damage to equipment, injury to persons, errors in judgment, or depletion of your finances. By using this product user accepts full responsibility for any damage or injury to persons or property that may result from using this product. Hey, I gotta protect myself. Keep in mind that front suspensions have very strong front springs that can easily kill if not properly restrained (usually the larger the engine, the stronger the springs and the more dangerous). Take precautions to ensure that the springs are compressed and restrained using a quality coil-spring compressor and a chain. Again, keep in mind if the spring breaks free it can cause serious injury and/or death. Using a chain as a restraint could mean the difference between life and death. If you don't plan on completely overhauling the front suspension, inspect the front suspension before the swap to make sure it is in good shape, that way you can replace all of the worn components during the swap. Concerns about suspension geometry can be settled by looking at the parts to be used. 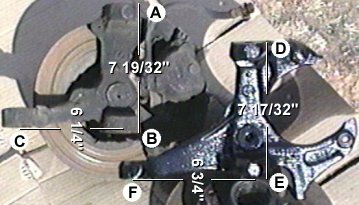 Below is a picture of my original H-Body 4-lug components compared to the S10 5-lug parts I installed. 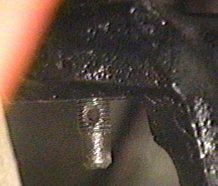 Notice that the difference of the outside dimensions from the top of the upper balljoint boss to the bottom of the lower balljoint boss is only 1/16" and the difference in the length of the tie-rod arm is only 1/2". 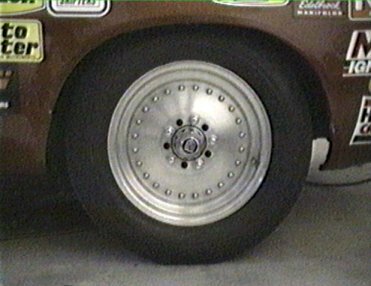 I prefer the S10/S15/Blazer parts since the lug-nuts/studs are larger (stronger) and the steering knuckle on the spindle is only 1/2" longer than the stock Monza piece whereas the G-Body part is a full inch longer. Keep in mind that the S10 studs are metric and will require size 12X1.5 lug nuts. For you racers, you will want to get longer lug studs so they will protrude past your open lug nuts (length depends on wheel thickness). NOTE: when using the adapters, you must use 1975 or later lower balljoints as the 1974 and earlier lower balljoints are too small. 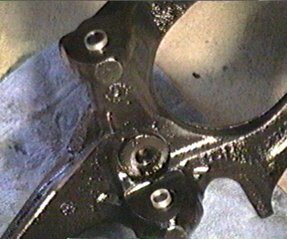 All H-Body upper balljoints are the same size. Late model balljoints are still available at your local parts store. As you can see, the S10 spindle (lower right) is beefier than the H-Body piece. The distance between balljoints is less on the S10 part, but the tie rod arm is 1/2" longer. Set the parking brake, and break the lug-nuts loose on the front tires. Lift and support the vehicle using a lift or a hydraulic jack and 4 jack-stands. The lift points are shown in the figure to the right. 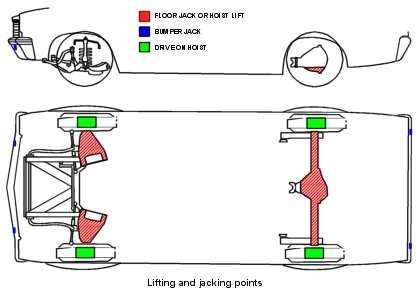 Place two jack-	stands under the vehicle so that they contact the forward sub-frame, place a jack-stand between the lower balljoint and the outer tip of each lower control arm. 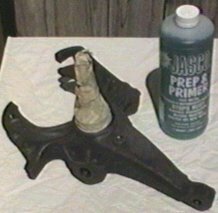 If the vehicle still has an engine installed the jack-stands will support the lower control arm and the vehicle's weight should keep the coil-springs compressed. WARNING: If the vehicle doesn't have an engine installed you will need to compress the coil-springs. Coil-springs are very strong and may overcome the leverage causing the springs to violently break free after balljoint nut removal with possible injury or death resulting. Compress the coil springs before removing the balljoint nuts, and always use a safety chain to restrain the coil springs. Remove the lug-nuts, front rims and tires. 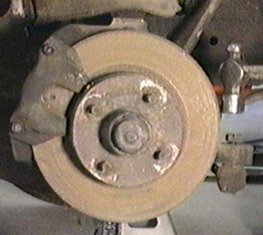 You won't need any of the factory equipment from the spindle out (including the old brake lines), so don't waste time removing the caliper and rotor. 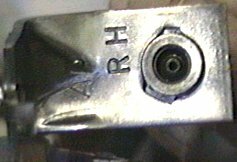 Using a 7/16ths line wrench, disconnect the brake line at the hard-line connection just behind the upper control arm. Using Vise-Grips, remove the brakeline retaining clip from behind the brakeline support bracket. Using a 1/2" socket, remove the brake line support bracket bolt (located just behind the bracket) and retain the bolt and bracket to be modified for use with the new brake lines. The brake line should now be free from the vehicle, but should still be attached to the caliper. 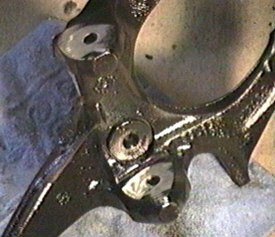 Remove the cotter pins and loosen the upper and lower balljoint nuts and the tie-rod end nut, With the balljoint nuts loosened, tap on the tie-rod end balljoint tip with a hammer. It should drop free with little effort, remove the nut and lower the tie-rod end. Tap on the upper balljoint tip and it should also easily break free, remove the nut and lift the upper control arm and swing the upper part of the spindle out from under the balljoint. Now the lower balljoint must be freed. 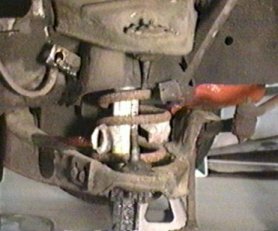 Usually a balljoint fork is required to free the lower balljoint, especially since the lower control arm is being supported by one of the jackstands. So tapping it with a hammer will not be effective. Using a balljoint fork, separate the spindle from the lower balljoint. Carefully lift and remove the spindle assembly from the vehicle. Now would be a good time to replace any faulty front-end components since the next step involves prepping and installing the S10 (or GM G-Body) parts. Remember, before installing the modified spindles 1975 or later H-Body lower balljoints are required. Vega's lower balljoints are smaller and will not work. Disassemble the S10 components, clean them, and inspect them for wear, damage, cracks, and corrosion. Once the parts are cleaned and all rust is removed, use a treatment that will stop any rust that may have been missed and prep the surface for paint. After the spindles have been painted and dried, it's time to install the balljoint adapters. The adapters are simple looking pieces made of mild heat treatable steel (heat-treated steel not required) that act as spacers between the balljoint and the larger hole of the S10 spindle. They eliminate the need to modify the control arms to accept the S10 balljoints. This makes this kit a solution that requires no modification of the control arms, saves you time and money, and allows restoration back to 4-lug if desired. The large adapters are for the lower balljoints and the small adapters are for the upper balljoints. Test fit the adapters first to ensure you have the correct adapter for the hole you're working on and that the corresponding balljoint on the car fits as well. The lower adapters are the large ones and the upper adapters are smaller. You must use 1975 or later lower balljoints, lower balljoints for earlier model H-Bodies are too small. 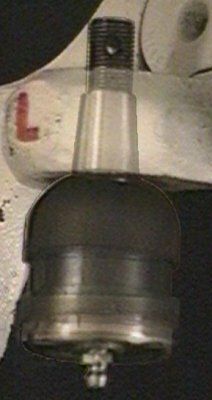 Additionally, many replacement upper balljoints come with a castle nut (3/8 - 24 NF) whose hex is dimensionally smaller (9/16") than that of the original (11/16"). 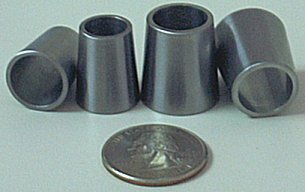 As for replacement lower balljoints, they come with a castle nut (1/2 - 20 NF) whose hex is dimensionally smaller (13/16") than that of the original (7/8"). As you can tell, both replacement nuts have a smaller footprint and less material to hold the balljoint into position in the larger holes of the S10 spindle. WARNING - USE THE LARGER CASTLE NUTS, DO NOT USE THE SMALL CASTLE NUTS. The larger castle nuts are usually not available at a hardware store, so ask your local GM parts store. GM lists the nuts (see below) in their parts catalog, but they’ve been known to transpose the ID and part numbers, so double check the parts before you buy. 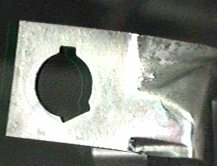 …………………………..OR………………………….. Nut, Slotted (Castle), Heavy Duty 3/8" - 24 NF (11/16" Hex) slot 0.125"
Nut, Slotted (Castle), Heavy Duty 1/2" - 20 NF (7/8" Hex) slot 0.150"
Coat the adapter’s outer diameter with thread-lock then slip the adapter into place. DO NOT HAMMER THE ADAPTERS INTO POSITION. This may cause deformation of the adapter to occur. Once the adapters are installed, they should NOT protrude from the small side of each hole. This is because the adapters are designed to be short so that they don’t interfere with the threads of the balljoint or castle nut and will seat properly when the castle nut is torqued. However, because of the + or - 0.005” tolerance, they may protrude from or be countersunk into the large end of each hole. The adapters in this picture grossly exaggerate the condition for illustration purposes only. You may trim the protruding ends of the adapters so that they are flush with the spindles factory surfaces on each side of both ends (large end of each hole only). This will result in some flash inside the adapter hole. Using a utility knife or other suitable method remove the flash and bevel the sharp edges. Touch-up the spindle ends with another coat of paint and allow to dry before installation. Installation is the reverse of removal. 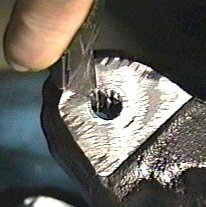 Tip - install the balljoints so that the cotter pin hole is easily accessible from either side of the spindle. That will make installing and removing the cotter pins much easier. Attaching the new brake hardware to your existing H-Body brake system is a challenge, but one easily tackled with some ingenuity. As can be seen here, the brake hose to brake line bracket has keyways in it. As luck would have it, the keyway is just the opposite of what it needs to be and swapping the brackets won't solve the problem as they are both keyed the same. The top-left picture shows the side that the brake hose must mate to (shown mated in the top-right picture). The lower-left picture shows the backside of the bracket with the factory Monza brake hose inserted into the keyed hole. The Monza brake hose is too short to reach the S10 brake caliper requiring a set of new 15" long hoses with an end shaped like the bottom-right image. I used a pair of Brakewareâ P/N 88624 hoses purchased from AutoZone for just $15.00 each. However, NAPA sells TruStopâ P/N 4136845, which doesn't require modification to fit the bracket. 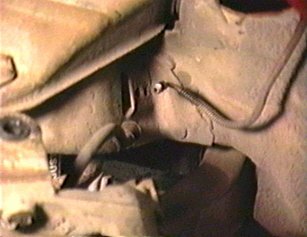 Both brake lines are originally designed for the 1976 Chevy Nova. So if you can't find these, ask for '76 Nova lines. Here you can see the difference between the keyways (viewed from the backside of the bracket) of the old hose (inserted) and the new Brakewareâ P/N 88624 hose. Remember, if using the TruStopâ P/N 4136845 lines, you shouldn't have to modify your brackets. Modify the bracket using a small fine toothed file. Note the new keyway on the bottom left (brake hose side of bracket shown). The right picture shows the side facing the brake hose with the new key at the 7 O'clock position. 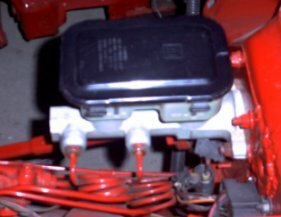 Once the brake lines are installed, you're ready for the master cylinder. I've been told later model H-Bodies (1976 and later) that came from the factory with vented front rotors have a larger master cylinder and it doesn't need to be swapped. If you do need to swap your master cylinder, the G-Body and S10 (or some F-Body) master cylinders are the best (as far as I can tell). 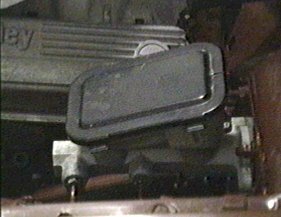 But the G-Body reservoir will not work because it is tilted forward (see picture - lower right). So get an S10/S15/Blazer master cylinder with it's reservoir (see picture - upper right) or purchase the reservoir separately. Otherwise, you'll ruin the paint when the brake fluid spills out during servicing and you'll never get it FULL again. Don't forget to get the S10 proportioning valve as well or install an aftermarket adjustable proportioning valve or your brake bias will be incorrect resulting in malfunctioning brakes. 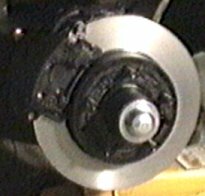 NOTE: H-Bodies originally equipped with vented rotors (usually 1976 and later) are reported to have the correct brake proportioning. G-Body Type DO NOT USE! The larger S10 front brakes will greatly enhance your vehicle's braking ability. The discs are 3/4" dia. larger than the H-Body's and aftermarket S10 discs and calipers are even larger. Mounting the 15" X 6" Centerlines equipped with 6.00-15L tires leaves just barely enough room to turn the tires in the fender wells. If you enjoy our website and the information it provides, you can help us pay for the equipment and supplies it takes to keep our project going by sending donations. We appreciate all the help you can give us to keep the site going. Also, we are always looking for sponsors, so if you buy something from a company we've mentioned, please tell them we sent you. It might help us secure a sponsor.